Ian Freeman Talks Bisping, IFL, and MMA in the U.K. 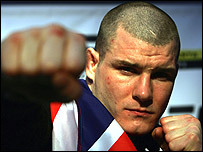 I had a chance to talk to British MMA legend Ian “The Machine” Freeman yesterday. This guy is a real character. If you’re looking for a good MMA-related read, I recommended his memoir, “Cagefighter”. It has more crazy stories about blokes in pubs than ought to be legal for consumption in America. If Rashad was fighting his best, it proves that Mike really belongs in there with anybody. He had kind of a bad fight with Matt Hamill and a lot of people thought he lost that fight, but whether he did or didn’t I think he proved his worth against Rashad. I believe he did lose the fight, but it was very, very close. I was proud of how he fought. Even though I argued Bisping’s case on this blog a couple of days ago, I can live with that assessment. Freeman went on the say that he thinks the U.K. might be a few years behind America in terms of developing MMA fighters, but fighting abroad and seeking out new people to train with in the States is helping them catch up. I don’t expect anyone to agree with what I’m about to say. I’m not even sure I agree with me, at least not a hundred percent, but something about Saturday’s decision didn’t sit well with me. Is it because I find Michael Bisping a little more likable than Rashad Evans — whose nickname, “Sugar”, could not possibly be less fitting? Maybe. It could also be because I hate seeing wrestlers win decisions for doing very little besides taking people down. I’m not sure, but just for the hell of it, here are my reasons why Bisping deserved to win that fight. I’ve gone on and on about how I don’t think the ten-point must system is working for three-round MMA fights, so I’ll spare you that lecture this time around. But even within that system I think Bisping deserved to win. Evans took round one fairly obviously. He landed a couple of shots on the feet and took Bisping down, even if he didn’t do much after that. Bisping, on my scorecard, won round two. Round three was close, and I think it belonged to Bisping for stuffing most of Rashad’s takedown attempts and landing with greater frequency on the feet. But the reason I think Evans won round three on two of the judges’ scorecards was because of the way the round finished. It almost looked as if Evans was about to mount an effective offense, but that last takedown (kind of) meant nothing. Bisping controlled the majority of the rest of the round, and what happens last in a round shouldn’t influence the judges any more than what happened one minute in. At the very least, the third round was even, 10-10. Bisping made a point of saying that the reason he thought he won was because he negated Evans’ takedowns by getting back to his feet without sustaining damage. When he first said that, I thought it sounded like a man trying to rationalize things to himself. As I thought about it, however, the idea grew on me. A takedown is, in some way, like a submission attempt. It is a step in the direction of an effective offense. It is not, by itself, a significant offense. KO-inducing slams aside, fights have never been ended by takedowns. A takedown is a way of getting your opponent into a position more favorable for you to mount an offense from. If you take a man down and land in his guard, then do nothing to hurt him before he stands back up (note the difference between him standing up on his own and him waiting for a referee standup), why should that decide a fight? If a fighter preferred to fight in the clinch and was successful at forcing one upon his opponents, even if he couldn’t damage them from the position, should that gain him a victory just for imposing his will? Think about it: after the first round, what did Evans do well besides take Bisping down? If we reward takedowns that lead to nothing, we’re essentially rewarding a stall tactic. That’s not a strategy I want to see become widespread in MMA. I’m not one of the people who believes that Pride was superior to the UFC. Not at all. But I will admit that I preferred their scoring criteria. Not only was it free of the phrase “Octagon control”, but it took into account attempts made to finish the fight. Sure, an attempt to finish a fight isn’t the same as finishing one, but it does encourage fighters to actively look for the victory rather than doing just enough and then holding on for a judges’ decision. Under that criteria (which is not the UFC’s criteria, I know) Bisping deserved to win. He was looking to damage Evans throughout the fight, not looking to stall his attack. I also liked the way Pride scored the whole fight and not individual rounds. Especially in MMA, where fights are only three rounds, the ten-point must system is deficient (damn, now I’m back on that sermon). A fight can be drastically different in round three than it was in rounds one and two, but the ten-point must system isn’t equipped to compensate for that. A fighter can just coast through the third if he’s confident he won the first two, and the worst that’s likely to happen is a draw, assuming the final frame is scored 10-8. What we’re asking judges to do is tell us who won the fight, and how can they do that until the fight is over? I realize that will shift even more focus to what happens last, but fighting should, to some extent, be about who can last the distance and not just who can do enough to win individual rounds. To make a terrible analogy that I will later deny ever making, which part of a war would you rather win: the beginning or the ending? There. Glad that’s over with. Now, having made all these arguments, I’m still not sure I really believe that Bisping should have won. The fight was close no matter how you look at it, and judges’ decisions are always going to be maddeningly unpredictable. I suspect that a lot of people wanted to see him lose a close decision because they felt he stole one in his last fight. It’s kind of like what’s going on with O.J. at the moment, only Bisping isn’t at fault for what the judges did in his last fight and O.J. is, well, really at fault for a lot of stuff. I guess what I’m really trying to get at here is what I see as a flaw in the scoring system. MMA isn’t boxing, so why are we using boxing’s scoring system? The answer (or, for Spike TV fans, the “manswer”) probably has a lot to do with state athletic commissions and their requirements for regulation, but sooner or later MMA is going to reach a critical mass in terms of popularity that will allow it to dictate what form it takes. When that day comes, I hope the scoring system is one of the things they’ll take a long look at. All the promos in the world couldn’t change the fact that last night’s UFC event was essentially without a main event. Nonetheless, Rashad Evans and Michael Bisping put on a decent show with their extremely close three-round bout, and this time it was Bisping who came out on the wrong end of the judges’ decision. As advertised, Evans relied on takedowns early and often to sway the judges in his favor. Bisping’s inability to stop him resulted in the Brit losing round one, though Evans seemed to fade after that point. After the split decision was announced, Bisping said he felt that he won the fight and negated Evans’ takedowns by getting up from each one without sustaining damage. I have to admit that seemed like a novel — though mostly fabricated — criteria for judging fights. Nowhere does it say that getting up from takedowns without sustaining damage negates them. In fact, nowhere does it say anything about how to score takedowns in MMA, which is part of the problem. But Bisping may have been onto something. In rounds two and three Bisping looked like the sharper fighter on the feet, and while Rashad managed to put him down a couple of times, he never had Bisping in any danger and made very little effort to finish the fight. I though Bisping deserved to win this decision as much as he deserved to lose the one against Matt Hamill. Maybe this is a way of the universe (or the UFC) evening things out, but Bisping proved that he does have the potential to be a top-ranked fighter down the road, if he fills out his game a little more. The other fight the UFC tried to hype into a major contest was the Houston Alexander-Thiago Silva match. Alexander has enjoyed a big push from the UFC after his two quick KO victories, but he showed against Silva that for as intimidating and explosive as he is on the feet, he is equally helpless on the mat. Silva had zero trouble passing his guard and moving to full mount, where Alexander’s answer was to grab Silva’s body and hold on for dear life. For those of you less familiar with the finer point of the ground game, that does not constitute an appropriate defense or escape attempt. Alexander looked as if he’d done about fifteen minutes of jiu-jitsu in preparation for this fight, and none of it was spent learning how to deal with escaping the mount. Seems odd, considering he knew he’d be taking on Chute Boxe fighter Silva. Did he not know that Brazilians are born with a working knowledge of submissions? Alexander’s inability to escape led to him being knocked briefly unconscious by a flurry from Silva, then knocked back into consciousness, then back out again. After the first-round stoppage, Alexander seemed angry and confused, which is understandable after that performance. – Ryo Chonan never got going against Karo Parisyan, and the heat rolled to another lackluster decision victory. This time he did it without the benefit of flashy judo throws, but a win is a win. – Ed Herman showed Joe Doerksen just how much he’s improved since their first meeting, although his recklessness almost cost him as he got caught in a tight triangle choke just before being saved by the bell in round two. He would go on to knock Doerksen out with a left hook in the third, and could be heard on the broadcast trying to convince ring announcer Bruce Buffer to call it a KO instead of a TKO. That’s cute. – Joe Lauzon easily defeated Jason Reinhardt, and announcer Joe Rogan couldn’t stop talking about how “sharp” he looked doing it. While I agree that Lauzon looked good, he fought a 38-year-old Octagon rookie who had no business in there with him. Other than a paycheck, I’m not sure what Lauzon really got out of that fight. The guy beat Jens Pulver, so save the tomato cans. – Spencer Fisher looked flat-footed and uninspired against Frankie Edgar. Edgar won the decision with takedowns and ground control, and if he can add a few more weapons to his arsenal he might be a title contender someday soon. Fisher never got going at all and seemed tentative the entire time. Overall, UFC 78 was about as mediocre as it looked on paper. I’m just surprised they didn’t do more during the broadcast to hype UFC 79, which has at least two main events. Moving on. When the UFC announced that the main event for UFC 78 (entitled “Validation”, in case you were wondering, but you weren’t) would be the bout between Rashad Evans and Michael Bisping, I was the first to make idle threats about not paying to see it. While I still don’t believe this fight constitutes a main event, the fight card has improved with Ryo Chonan stepping in to take on Karo Parysian. If you don’t know who Chonan is, you should. He’s a Japanese fighter who personally made the Pride Bushido series significantly better, and he’s also the last person to beat current UFC middleweight champion Anderson Silva — with an awesome flying scissor heel hook (previously thought only to exist in fairy tales and instructional videos). Chonan’s record (14-7) is deceptively mediocre, as several as those losses come against bigger fighters who Chonan never should have been matched up with, guys like Dan Henderson and Phil Baroni (the Phil Baroni who suddenly regained his power and explosiveness upon coming to Japan, the land of no steroid tests…just saying). While Pride didn’t do Chonan many favors in the matchmaking department, he still managed to prove himself an exciting, tenacious fighter. This is a tough change of opponents for Karo Parisyan. He was originally slated to face Cuba’s Hector Lombard, but when Lombard was denied a visa to come to the U.S. (now we’re even for the Bay of Pigs) the UFC was forced to scramble for a substitute. While Lombard is no chump, Chonan is a decidedly better fighter and will require a much different approach by Parisyan. While Lombard specialized in Judo, like Parisyan, Chonan is more of a complete fighter. He’s also used to facing stronger opponents, so a match with Parisyan at 170 lbs. is almost a vacation for him. Beating Parisyan for his first UFC fight would be a tremendous career boost for Chonan, but losing would likely drop him down to UFC Fight Night cards along with former TUF contestants, and he didn’t come all the way from Japan to be a lead-in for Manswers. This fight is a key addition for a card that is essentially without a main event. If the UFC can’t come up with a meaningful fight to headline the event the best option is to strengthen the undercard with competitive, mid-level fights. Right now they have the makings of the best UFC Fight Night or the worst pay-per-view. Maybe one more solid fight on the level of Chonan-Parisyan and they’ll have an event worth shelling out $39.95 for. As of now, I’d say the status of UFC 78 has been elevated from “questionable” to “aiiiight”. And yes, those are official categories. Stop asking so many questions. Bisping vs. Evans a Main Event? Michael Bisping and Rashad Evans will square off on Nov. 17 as the main event of UFC 78 in New Jersey, the organization announced yesterday. This news made me glad that I didn’t decide to try and purchase tickets to this event, even though it’s the closest the UFC has come to New York City since I’ve lived here. First, the event is in Newark, which is probably the worst city in America. It combines the squalor of a heavily industrialized town with the rampant crime and violence of an economically depressed one, making for one giant cesspool of unpleasantness. Second, Bisping-Evans is not a main event. Not for a big time pay-per-view, anyway. If this were a UFC Fight Night or some other free TV broadcast, I wouldn’t complain. But if you want my $39.95 you have to give me a real main event, and some other bouts that are better than the likes of Hector Lombard vs. Karo Parysian wouldn’t hurt either. Granted, I’m sure I could think of some exceptions if I really tried hard enough, but I think those criteria are pretty fair. If it isn’t a title fight and it isn’t a fight to see who gets the next title fight, I have to ask why it deserves to be the headlining bout. If it’s because both guys hate each other or have something to prove against one another (a rematch maybe, if the first meeting was great) then I’m all for it. But Bisping-Evans doesn’t meet any of those definitions. Bisping is coming off a lackluster win with his questionable decision over Matt Hamill. Evans is coming off a fairly exciting draw with Tito Ortiz. It makes sense to have both Bisping and Evans on this card, but why against each other? This brings up a possible fourth criteria for a main event: if you can’t provide quality, settle for quantity. I’d be perfectly fine with this card if both Bisping-Hamill II and Evans-Ortiz II were on it, perhaps as co-main events. That way, when I consider whether to spend my money on the pay-per-view (or whether to actually get out in the world on Saturday night), I’m comforted by the thought that with two potentially big rematches on the card, at least one of them will probably deliver. What concerns me most about the UFC simply labeling Bisping-Evans as the main event (which is what they did, after they announced the match would take place) is that it seems a little lazy, as if they’re taking me and my pay-per-view cash for granted. One of the good things about the rise of so many other MMA promotions is that the competition for viewers should bring better events. But right now the UFC knows they’re the biggest show in town, and they might be starting to feel like whatever they put out there will sell. As much as people are complaining about the UFC 77 lineup (which I think is pretty solid), at least there’s a title fight. Maybe one of the reasons there isn’t one for UFC 78 is because the welterweight title has been languishing in reality TV land instead of being up for grabs in the open market. I’m not saying I can’t understand this decision. Every card can’t have the fight of the decade, and that’s fine. But I’m also not saying that I’m automatically going to pay to see a fight just because the UFC tells me it’s a main event. Sorry. I’m also not going to stick around on Spike TV and watch Manswers just because it comes on after The Ultimate Fighter, but that’s a topic for another day. A very sad day, which most likely ends with me in tears.